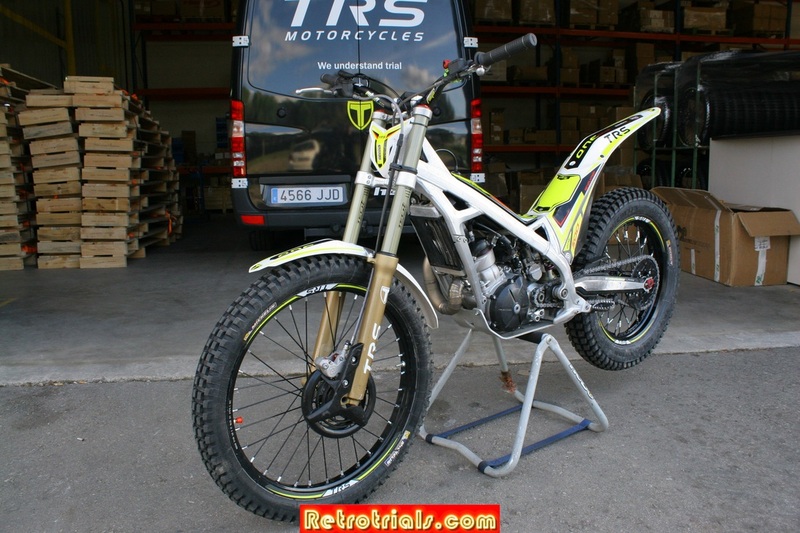 In April 2016 Retrotrials.com was taken to the TRS factory. This is located on the outskirts of Manresa in a small town called Sant Fruitós del Bages in Catalonia. 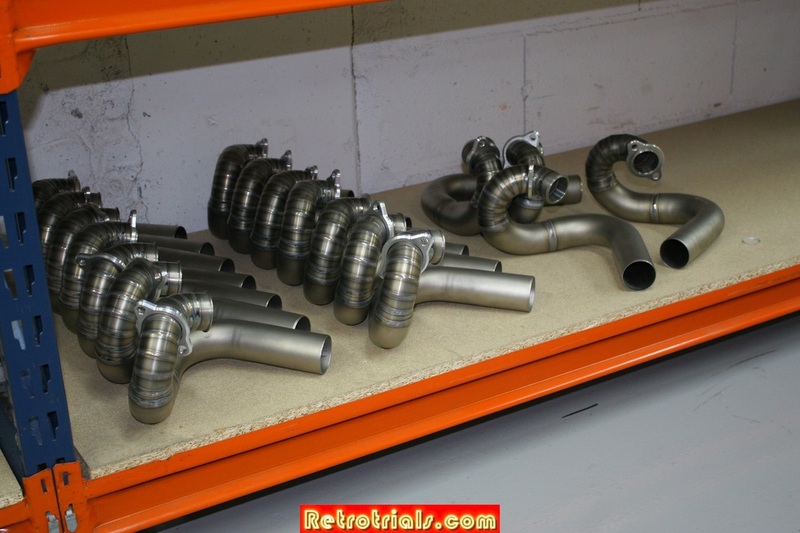 I had not specifically planned to visit this factory at this time ,however was taken there to collect some spares for the TRS ONE of Pol Tarres in preparation for the opening World Trial in Cal Rosal in April 2016. I love trial factories both old and new and couldn't resist the opportunity t take a few snaps for Retrotrials.com. At the time of my visit the TRS race bus was already parked up in position at Cal Rosal. This is the reason why the machines assemblers were not at the factory making bikes. 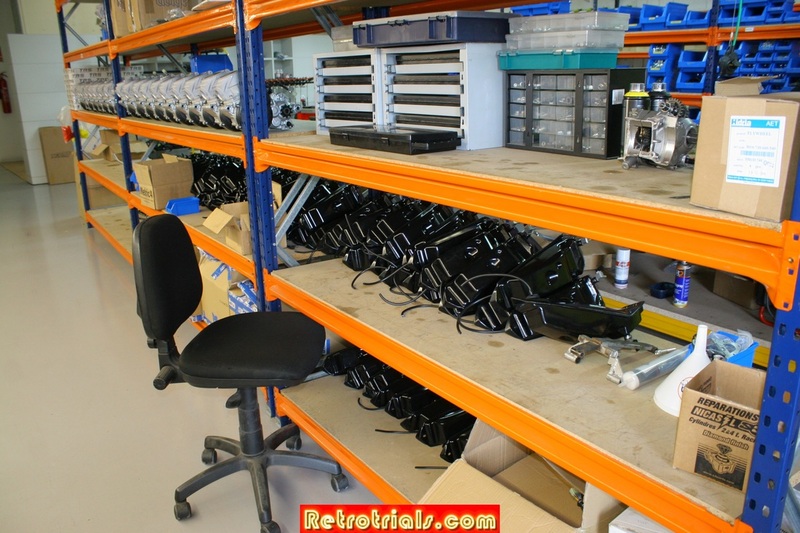 The factory was very well organised with huge stock levels. I would love a garage like this ...in a climate like this . Wouldnt you ? 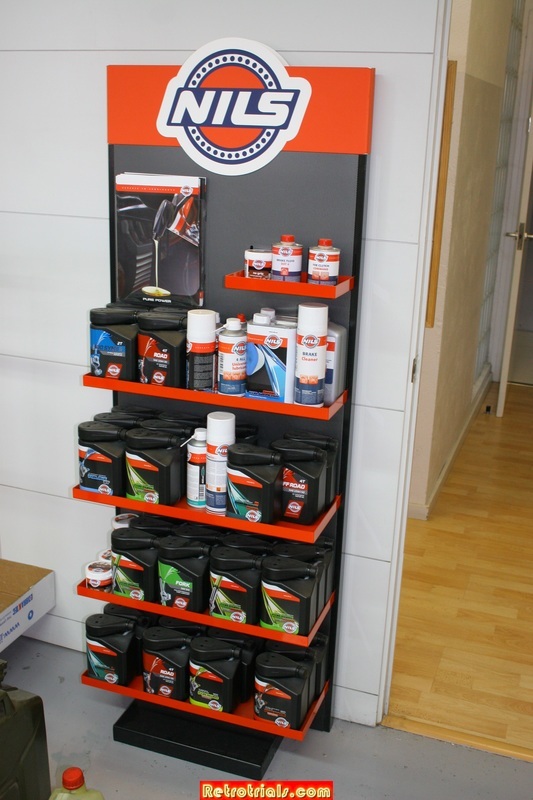 The factory is set on a modern industrial estate 5 kilometres outside of the busy town of Manresa in Catalunia. Jordi Tarres the TRS designer works here every day along with a team of 5 machine assemblers including Senior factory mechanic Paco Roldan. Marc Arano , the TRS sales and factory manager is also based here. 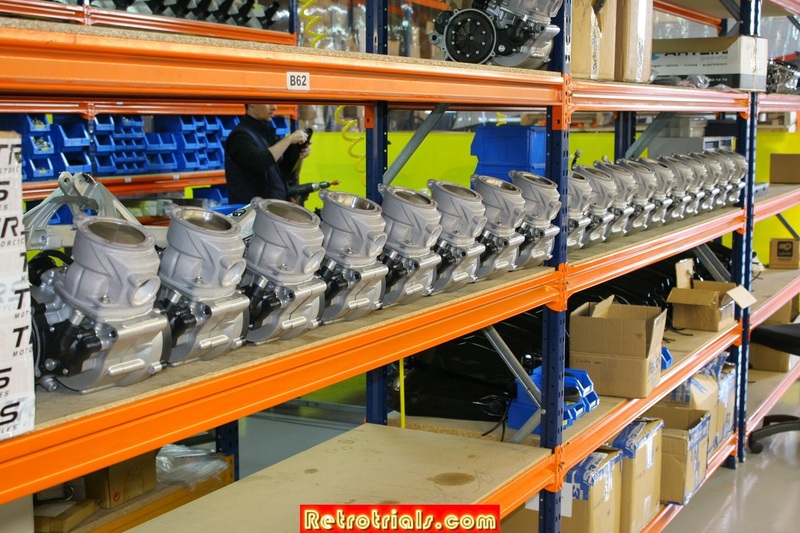 The factory aim is to produce 5 TRS one motorcycles each day. 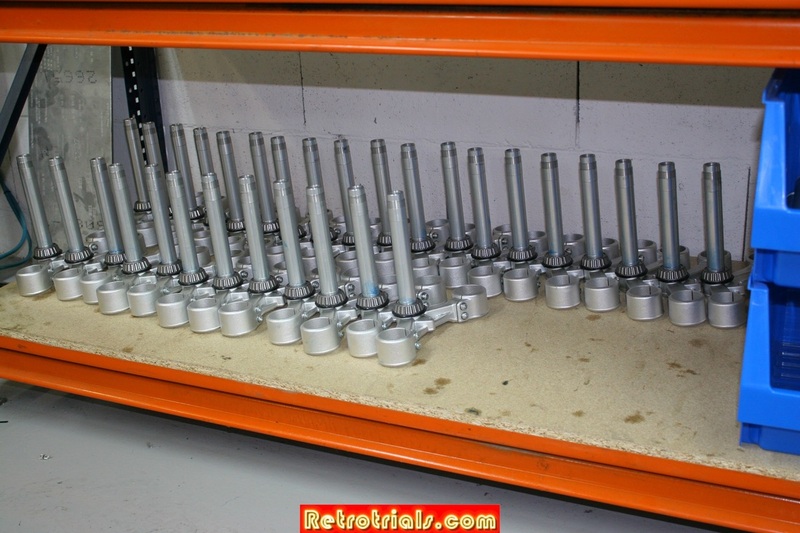 Many many assembled swinging arms with handlebar and brake assemblies beyond. 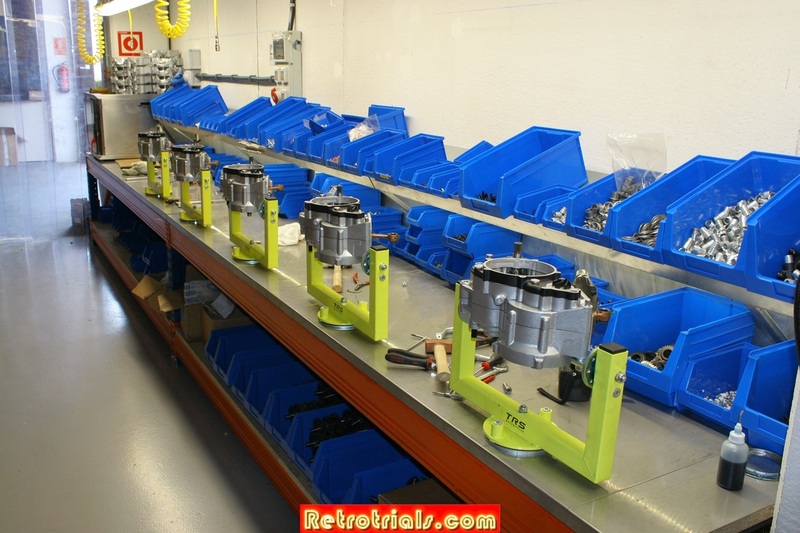 All of the engines are assembled here on engine stands specifically made for the TRS engine. The factory was taken on as an empty building and fitted out to the requirements of TRS. Whilst I am not by any means the oracle of motorcycle factory design, the TRS factory does seem to be the perfect size and location of a new motorcycle company. It was brand new , freshly painted and clean , but what struck me was this. The stock levels were very very good. 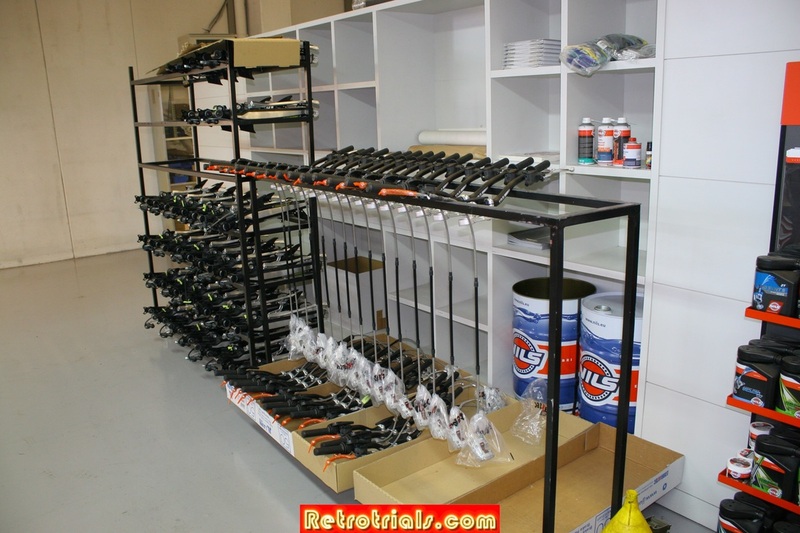 At the rear of the factory in an area were the team bikes are prepared the motorcycle parts shelves were stocked high up the ceilings very very high above me. You can see this in the photo beneath. 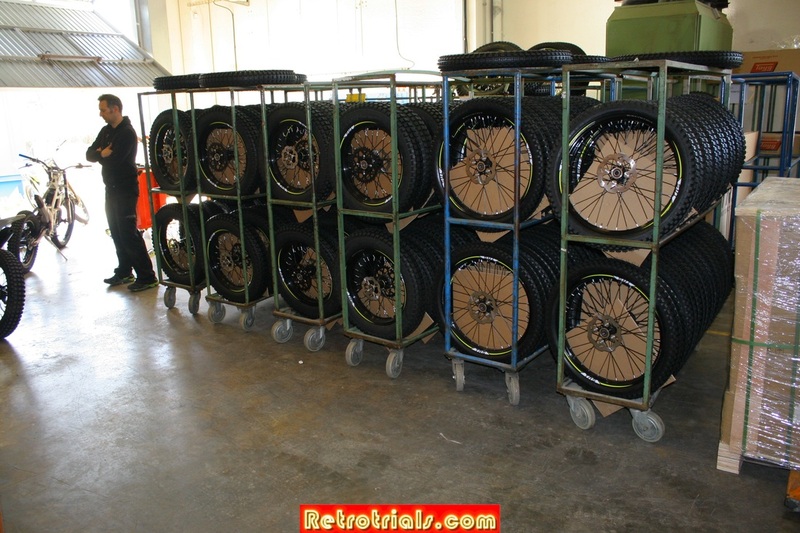 There weren’t just 20 wheels , there were hundreds of them. 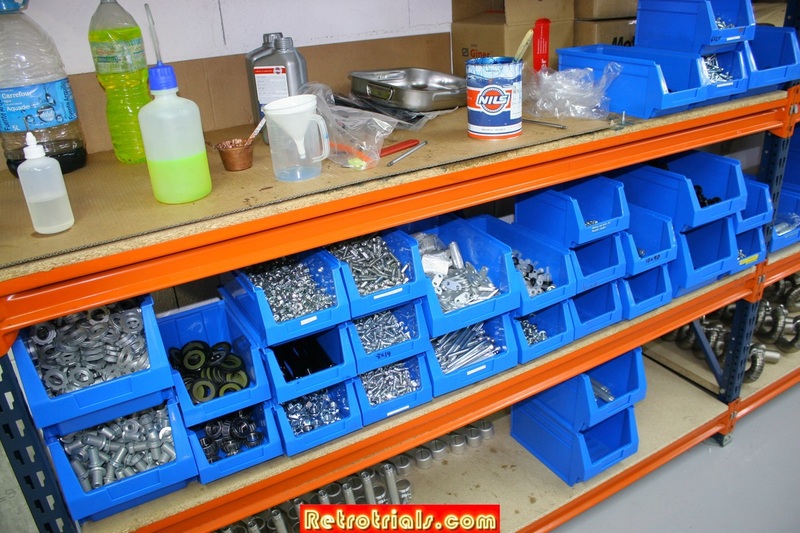 Parts had been bought in in huge numbers , reducing re ordering and the subsequent supply difficulties that can happen. TRS are ready to produce hundreds of motorcycles. They already have orders Worldwide for 1000 bikes so are working hard to satisfy this demand. The TRS company features a number of members of staff from the Jotagas Trial company but this is where the similarities end. The new TRS company is being led by Jordi Tarres and one major investor . They now have the freedom that they did not have before to guide the bike development , the customer care and the company in a way that they would have liked with Jotagas , but was not possible with Jotagas. All the best to TRS. Adam Raga's number one bike parked for photos at the rear of the factory after preparation and testing for the World Trial.